Director – Brad Bird, Screenplay – Josh Appelbaum & Andre Nemec, Producers – J.J. Abrams, Bryan Burk & Tom Cruise, Photography – Robert Elswit, Music – Michael Giacchino, Visual Effects Supervisor – John Knoll, Visual Effects – Industrial Light and Magic, Additional Visual Effects – Bad Robot Optical, Drive FX, Fuel VFX & Pixomondo, Special Effects Supervisor – Mike Meinardus, Makeup Effects Supervisor – Michele Burke, Production Design – James D. Bissell. Production Company – Paramount/Skydance Productions/Tom Cruise/Bad Robot. IMF agents Benji Dunn and Jane Carter engineer the rescue of Ethan Hunt from a Russian prison. Ethan is told he is needed for a mission to break into The Kremlin to find the identity of a terrorist known as Cobalt who is seeking to launch a nuclear weapon. However, the mission goes wrong and they flee just as a massive explosion goes off, destroying much of The Kremlin. The IMF Secretary informs Ethan that Ghost Protocol has been issued where the IMF has been shut down but suggests that Ethan and the team go rogue, moments before the car is fired at and the Secretary killed. Joined by IMF analyst William Brandt, Ethan and the others realise that Cobalt is former nuclear strategist Kurt Hendricks who wants to start a nuclear war to aid humanity in its evolution and that Hendricks staged the bombing of The Kremlin in order to steal the codes to activate Russian nuclear missiles. The group’s rogue mission takes them from Dubai to Mumbai up against Hendricks as he attempts to get the parts he needs to launch the missile. 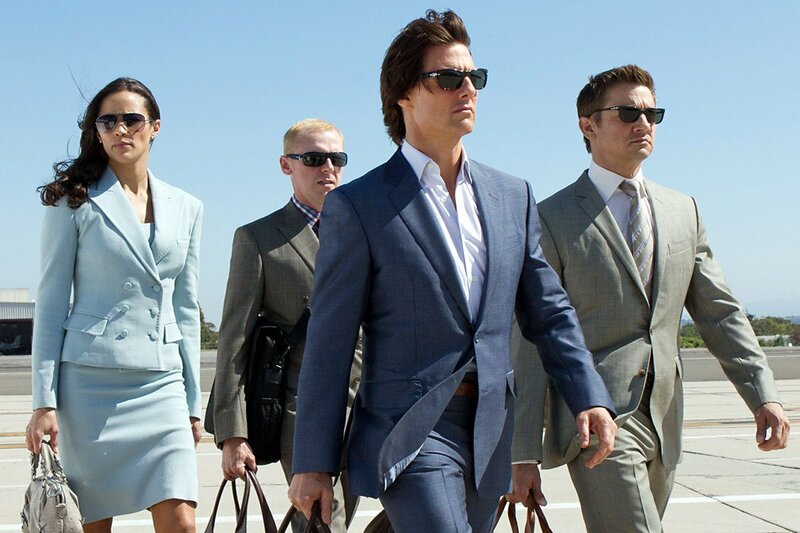 Ghost Protocol is the fourth of the Mission: Impossible films. These grew out of the original tv series Mission: Impossible (1966-73), one of the few serious contenders among the James Bond inspired fad for spy films in the 1960s. The original series went through various cast line-ups and revivals but always concerned a team where each member had their own field of expertise and would go into action to pull off some elaborately contrived scheme to fool an international villain. Come the 1990s and the series was revived amid the decade’s fad for big screen remakes of 1960s-70s tv series with Mission: Impossible (1996) starring Tom Cruise. This was followed by sequels with Mission: Impossible II (2000) and Mission: Impossible III (2006), Ghost Protocol and subsequently by Mission: Impossible – Rogue Nation (2015) and Mission: Impossible – Fallout (2018). Tom Cruise has taken an increasing hands-on control with each of the Mission: Impossible films – here he takes both a producer and production company credit. Cruise has also been the one asking for more and more elaborate international locations for the films, as well as pushing to give the directorial reins of each to increasingly chancier and untested names. The first film went with reliable name of Brian De Palma, the second took a relative chance on Hong Kong director John Woo who had newly arrived on US shores, while Cruise then raised Paramount’s eyebrows by insisting on the hiring of J.J. Abrams, who was at that point an untried film director, merely a tv producer responsible for Alias (2001-6) and Lost (2004-10). (J.J. Abrams is also present here as producer and co-produces the film via his Bad Robot production company, while the script comes from two scriptwriters/producers on Alias). With Mission: Impossible – Ghost Protocol, Tom Cruise goes even further and hires Brad Bird, previously a director only in animation with The Iron Giant (1999) and Pixar’s The Incredibles (2004) and Ratatouille (2007), as well as of the hilarious Family Dog episode of Amazing Stories (1985-7) that was later spun out into a tv series and co-writer of the script for the live-action Batteries Not Included (1987). In both of these cases one must say that Cruise’s instincts have been unerringly on target and the directors chosen have outshone themselves. 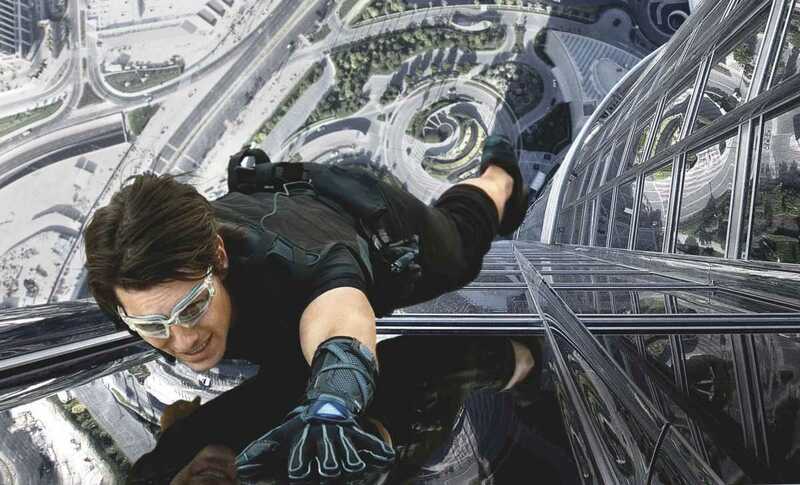 Mission: Impossible – Ghost Protocol promptly emerges as the best of the Mission: Impossible films so far. Run the four films end to end and you can see a progression – the stunts have become more spectacular and hair-raising; the locations much more elaborate; and you can see Tom Cruise’s fierce dedication to make the best possible film he can in every respect. Ghost Protocol also takes the film series far more back towards what the tv series was – the criticism I have made is that the Mission: Impossible films up to this point have strayed from the original concept of the tv series, which was always about a highly professional team going into action, to become star vehicles centred around Tom Cruise action hero, while the set-ups have become less about capers than stunts and spectacle. The team was there in the previous film entries but were so peripheral to the Tom Cruise presence that we never even found out what their individual expertises were. That said, Mission: Impossible – Ghost Protocol picks up the slack and places the team at the centre of the action. Here Simon Pegg’s techno-geek, who was introduced in Mission: Impossible III, and the new character of Paula Patton get into the action as opposed to sit in the monitoring van and are given almost as much screen time as Tom Cruise. Jeremy Renner, the hot new name as a result of The Hurt Locker (2008), even gets second-billing. Giving such a high profile casting to what is another member of the team, leaves the suggestion that Jeremy Renner is going to turn out to be a major villain even when there is eventually no more than a contrived addition of a back history between he and Tom Cruise’s character. The actual role of the villain is held by Michael Nyqvist, the overlooked other star of the original The Girl with the Dragon Tattoo (2009), who does a fine job but is not given nearly enough to do and certainly pales in comparison to the magnificent nemesis that Philip Seymour Hoffman made in the previous film. Also great is Lost star Josh Holloway, who finally emerges into an A-list role with a dashing handsomeness that immediately signals that he should be given his own film and/or more leading roles. The result feels like the first of the Mission: Impossible films to be making an effort to be going back to what the tv series was – there is even an old style tv series credits and theme music sequence to emphasise the return. Mission: Impossible – Ghost Protocol not only manages to feel like it is the culmination of what the other Mission: Impossible films were looking to find, it is the entry where the series gets everything right with spectacular results. The joy of the film is that it manages to be so much fun. There are frequent times that the action and gadgetry is so outrightly improbable that you can almost see Brad Bird and the scriptwriters inviting us to see how far they can push the suspension of credibility without toppling over into audience disbelief – like the moment the team casually suggest that they convert two entire stories of the Burj Khalifa, the world’s tallest building in the United Arab Emirates, to create an elaborate illusion that one floor is another or that in order to gain control of the building’s CPU, Tom Cruise has to climb several stories outside the building. Mission: Impossible – Ghost Protocol is far more science-fictional than all of the other Mission: Impossible put together. The gadgetry is so advanced that it operates on the level of Star Trek: The Next Generation (1987-94) magic holodeck technology at times – a lightweight screen that acts as a hologram projecting the illusion of the hallway behind it into a Kremlin guard’s eye; magnetic adhesive gloves that allow Tom Cruise to climb the sheer glass exterior of the Burj Khalifa; contact lenses that variously act as facial recognition and document scanners; a scheme that requires Jeremy Renner to be winched along a narrow tunnel using an anti-gravity suit that suspends him in mid-air. The constant running gag in the film is as much about the improbability of these devices as the fact that they are constantly failing at crucial moments, leaving Cruise and the others to have to improvise – the lifelike facial masks that were a feature of the other films are on the fritz throughout, for instance. It is this mix of hi-tech and jury-rigged that lead to the most spectacular scenes – the opening as Tom Cruise, with Simon Pegg’s help, breaks his way out of a Russian prison as it goes into full riot mode; car chases through the midst of a sandstorm; and especially the hair-raising scenes on the side of the building in Emirates with Cruise having to scale the sheer glass after one of his magnetic adhesive gloves starts to go on the blink and later conduct a freefall jump into an open window when the rope he is abseiling back down on fails to extend far enough. By the time of the climactic showdown between Tom Cruise and Michael Nyqvist on a series of car ramps, one’s exhilaration levels have been given such a workout that it feels disappointingly quieter in comparison. Brad Bird subsequently went onto direct the live-action Tomorrowland (2015) before returning to Pixar for Incredibles 2 (2018).